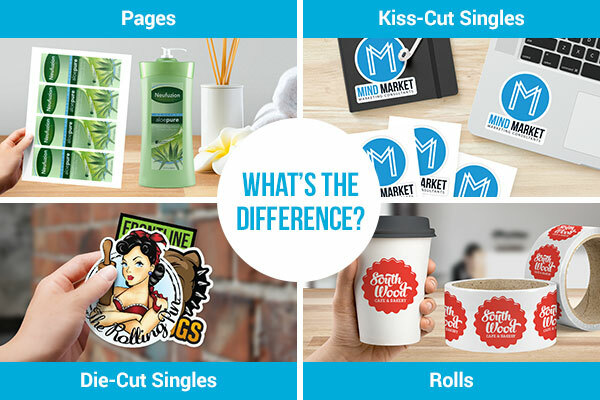 At StickerYou, we have a variety of sticker materials and formats for you depending on your application. 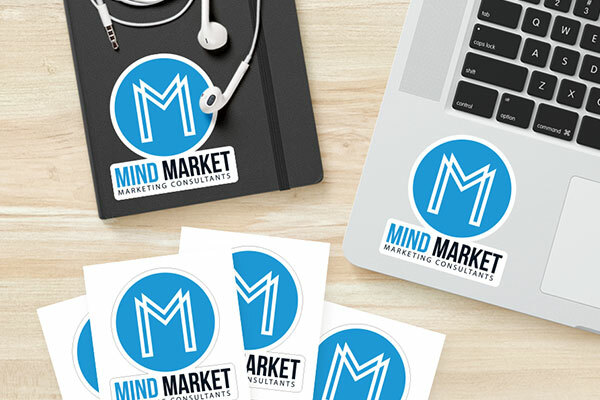 We understand that there are subtleties to stickers that impact your branding, and at times there can be uncertainty around what the best choice for your brand is. So, we are going to break down the differences and benefits of each sticker to help you make an educated decision! No matter which material you choose, our Sticker Maker makes it easier than ever to upload your custom designs and create your order online in minutes! Although the four specific vinyl sticker materials are listed below, it is important to know the general benefits of vinyl. Vinyl provides a slight flex or stretch in the material, which enables it to be more easily applied to both flat and curved surfaces. It is also very durable, and feels nice to the touch. This material has a strong adhesive to stay on your selected surface, and also uses bubble free air egress technology, making the application super easy and smooth. This material is also waterproof and outdoor durable, and can be removed easily without leaving behind sticky residue or adhesive. It is our most versatile and popular material, so if you are not sure what you want, the chances are you are going to really like our White Glossy Removable Vinyl. It can be ordered as pages or handouts (kiss-cut singles). Our matte vinyl is a great option to obtain a beautiful but non-shiny finish on your stickers. Matte stickers offer a more subtle, natural appeal, so the difference is really the aesthetic. On every other dimension, this material is the same as our White Glossy Removable vinyl - it is also waterproof, outdoor durable, and bubble free. White Matte Removable Vinyl can be ordered as pages or handouts (kiss-cut singles). When it comes to adhesive, permanent has the strongest “stick”. This makes them great for more industrial applications such as property identification and warning or safety labels. This material is also outdoor durable and waterproof. Permanent vinyl is easy to apply, but not bubble free. With the strong adhesive, you can be sure they will not be carelessly removed, making them great for outdoors. These can be ordered as pages or handouts (kiss-cut singles). Promote your business, create awesome window signage, or plug your event with StickerYou’s clear stickers. Although clear stickers can be used for many applications, the most popular are applications where you don’t want to see any white or colored background in your image - this is where the ‘clear’ helps, as it allows transparency. Consequently, these stickers are often applied to glass windows. These can be front or back adhesive to go on the inside or outside of a window. We also print with white ink, and UV coat the vinyl to give them abrasion resistance, as well as waterproof durability. Clear Removable Vinyl can be ordered as pages or handouts (kiss-cut singles). BOPP (Biaxially Oriented Polypropylene) is a plastic-based label material, which is ideal for labeling products that require durability and longevity. White Permanent Glossy BOPP is resistant to almost everything (fading, oil, heat, and abrasion), which makes it great for applications that will endure a lot of wear and tear. This material is ordered on rolls with a minimum of 250 units. The cost per BOPP sticker on a roll is generally less expensive than white vinyl - especially if you order larger quantities. If you want to give away stickers from a roll, you can request that the roll is perforated to allow them to be easily handed out directly from the roll. Matte BOPP is great for product labels that contain unique information, as it can be written on with pens, pencils, or marker. This allows you to write different flavors, expiry dates, and scents. They are also waterproof and reasonably durable (just not quite as protected as our durable BOPP, as there is no lamination on them). They are a great option if you want a natural packaging finish. Matte BOPP is the most “organic” looking material, as they have no gloss to the finish. This material is ordered on rolls with a minimum of 250 units. The cost per BOPP sticker on a roll is generally less expensive than white vinyl - especially if you order larger quantities. If you want to give away stickers from a roll, you can request that the roll is perforated to allow them to be easily handed out directly from the roll. The clear version of BOPP has all the benefits of the white BOPP, but with a transparent background. This material is perfect if you’d like to show the packaging through the sticker, or desire clear areas you’d like to show through. Our sticker pages are adhesive vinyl sheets, which are roughly the size of US letter paper (8.5x11”). Printing on pages opens up the possibility of printing multiple designs per page, and using StickerYou’s PageMaker tool. All stickers that come on pages are die-cut to your chosen shape, allowing you to easily apply! If you are on a tight budget, this format is economically ideal when you’re printing lower quantities (less than a few hundred), as there are no minimum order quantities, allowing you to test out various different designs or layouts. The three material options for sticker pages are glossy white glossy removable vinyl, white matte removable vinyl, and clear removable vinyl. Kiss-Cut sticker singles look similar to mini sticker pages. 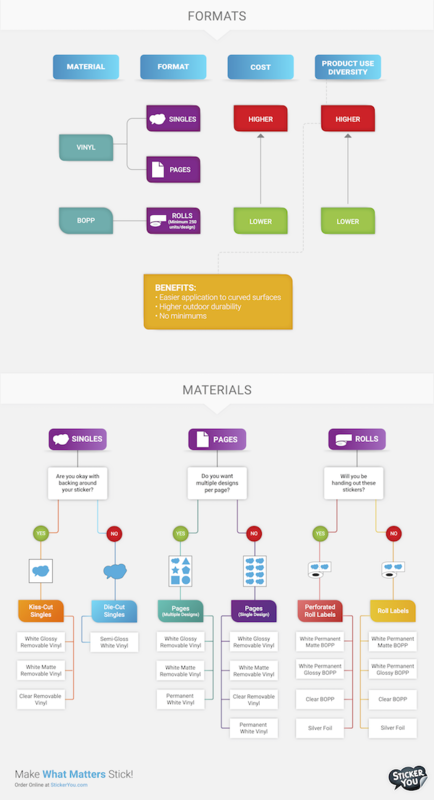 The size of the page will be determined by the size of the stickers you create in our online creator. These will arrive in stacks, and will be die-cut on each mini page. These are a great affordable option for handouts at events and giveaways. It’s also possible to print on the backing around the sticker, for additional branding before the sticker is peeled off! The three material options for kiss-cut sticker singles are white glossy removable vinyl, white matte removable vinyl, and clear removable vinyl. 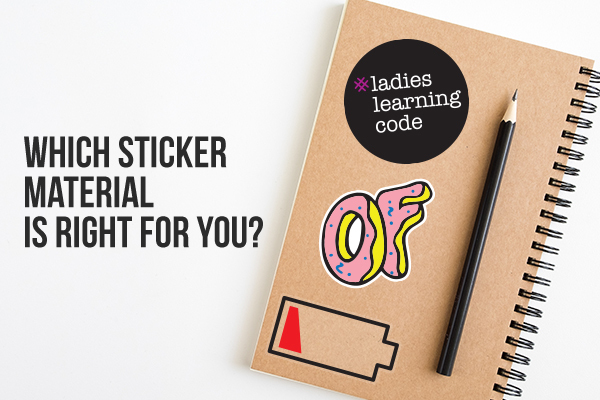 Looking for more than one die-cut for your sticker? 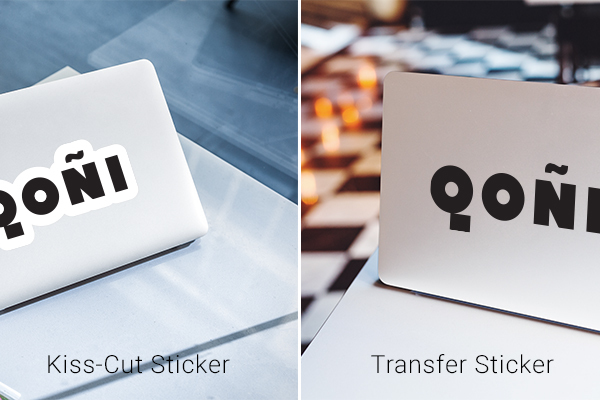 Our Transfer Stickers allow you to cut out the individual elements of your design. Transfer Stickers come on transfer paper with backing - this allows you to peel off the backing, apply your design, and peel off the front transfer paper, leaving only your multi die-cut design. Transfer Stickers are printed on high quality vinyl and can easily be removed if needed, without any residue or gunk! If you're interested in ordering some, or getting a quote, feel free to reach out to [email protected] - our sales team would be happy to assist you. Our roll labels have a minimum order quantity of 250 units, and are delivered on rolls of 250 stickers per roll. Each roll core is approximately 3” in diameter. Upon delivery, your labels will be die-cut on a backing paper roll, with no extra material around the design. This makes for easy peeling and application of your creation! The starting price point for roll labels is higher, but in larger quantities, it is almost always the most cost effective option. We also offer perforated roll labels, meaning the roll paper that your stickers on can be perforated between each sticker, making them great for giveaways and handouts. The three material options for roll stickers are white permanent glossy BOPP, white permanent matte BOPP, and clear BOPP. Die-cut singles are similar to kiss-cut singles, but have a more premium finish. These vinyl stickers are individually cut, and will be delivered in stacks without any extra backing around your sticker design. This is a great option if you want an end product that implies luxury and top-notch quality, as the die-cut goes through the sticker and the backing, leaving a flush, professional finish. Die-Cut Singles also have a semi-gloss finish, so they’re the perfect in between for a subtle yet beautiful shine. The precise die-cut brings your design to life, whether for business or personal expression! The only material option available for our Die-Cut Singles is a semi-gloss white removable vinyl.